On this episode of the All In Recovery Podcast, Mike and Joe dive all the way in to the controversy! 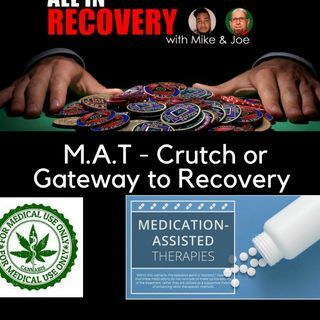 Mike and Joe discuss MAT( Medicated Assisted Treatment) and how the use of this style including the use of Marijuana could save lives! Should the narrative be changed, to harms reduction, rather than abstinence. Mike and Joe share their thoughts, passion, and witty banter, to provide thought provoking content in hopes to initiate a spark of influence and honest conversation.